A peek into Cuatro Cienegas takes you back several centuries to a time when this valley was covered in water; today, you'll find many traces of the area's past like wells, rivers and “cienegas” (springs) that capture the imagination of visitors. With all of its natural charms, Cuatro Cienegas earned recognition as one of Mexico's Magic Towns in March 2012. A peek into Cuatro Cienegas takes you back several centuries to a time when this valley was covered in water; today, you'll find many traces of the area's past like wells, rivers and cienegas (springs) that capture the imagination of visitors. 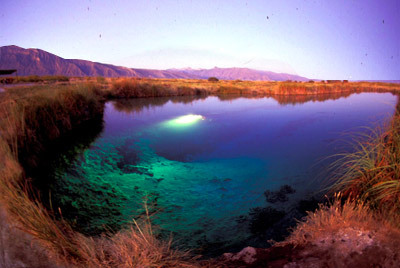 With all of its natural charms, Cuatro Cienegas earned recognition as one of Mexico's Magic Towns in March 2012. From October 12 through 21, 2012, the International International Balloon Festival on the Monarch Butterfly Route will be held in this lively setting, filled with tradition and natural beauty. This event is yet another reason to visit the Magic Town of Cuatro Cienegas. Experience a variety of culinary events, cultural activities and sports in the shadows of colorful hot air balloons, complete with music groups to add spice to this vibrant fiesta. The lively event kicks off with "A Night of Dragons". During the 10-day festival, visitors of all ages will have a blast with "callejoneadas", where you'll get to hear narrations of myths and legends about local heroes like Venustiano Carranza. You'll also see cultural demonstrations touching on topics like the environment and more, along with an incredible photography contest. If you're into sports and nature, the festival is the perfect chance to sign up for the "An Ocean in the Desert" Triathlon, or go horseback riding on the "El Constitucionalista" trail. For a sky high experience choose between an anchored or free flight in a hot air balloon. The International Balloon Festival on the Monarch Butterfly Route offers an ideal opportunity to learn, have fun and experience the beauty of Cuatro Cienegas, located close to Torreon and Saltillo.